Summer is upon us; the family are due to arrive in a couple of days and you just know that someone is going to mention the sorry state of your shower glass. You do a frantic search online for all sorts of homemade potions and methods to eradicate those unsightly water marks and mineral stains. Vinegar, baking soda, hydrogen oxide. Unfortunately, try as you might, homemade solutions are rarely effective and won’t stop those water marks or mineral stains from returning. 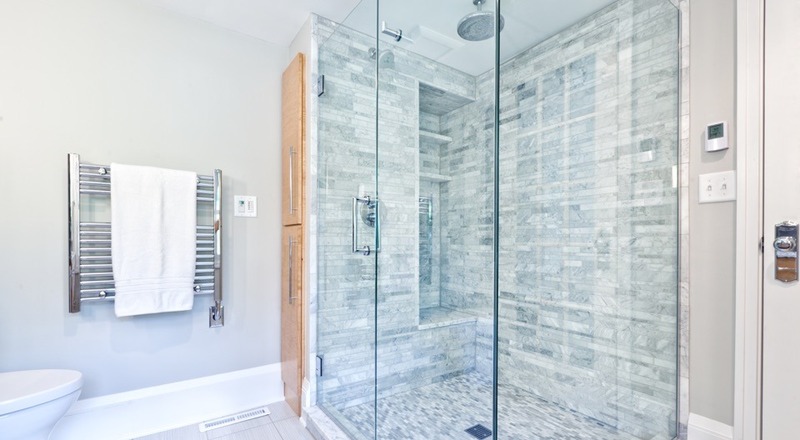 Here are three of the most common methods people use to try and clean shower glass to no avail. Looking for the best way to clean shower glass? Don’t waste time with homemade solutions — only Diamond Fusion NZ can rid your glass surfaces of water marks and mineral stains and stop them coming back. Contact us today or call 0800 66 72 78 to book a Diamond Fusion technician. Dug out those yellow rubber gloves from under the kitchen sink? Time to get down to it — this one requires a bit of elbow grease and frequent cleaning. In an effort to remove chalky streaks and mineral stains the vinegar technique will have you dipping a non-scratch sponge (or newspaper) into full-strength white vinegar. Next, you will have to scrub this potent formula all over the shower glass repeatedly until the streaks seem to disappear. Your shower glass will require frequent cleaning as this method won’t stop mineral stains and water marks from returning — only the world-renowned Diamond Fusion® formula can do this. Not a fan of the smell of vinegar? Neither are we. With Diamond Fusion® our unique global formula speeds up your shower glass cleaning times by up to 90%! No homemade potions. No chemistry lessons. No harsh chemicals. Save time and claim back your weekends by calling 0800 66 72 78 and booking a Diamond Fusion® technician today. Discover more about Diamond Fusion® NZ here. Did you pay attention in your chemistry classes? Luckily hydrogen peroxide isn't as dangerous as it may sound. However, that unsightly mould that's growing in your shower is. If you are noticing a growing mould patch you should deal to it as soon as you notice it. Mould can be very harmful to your health and cause a range of respiratory illnesses. Hydrogen oxide (H2O2) is very good at killing mould and can be found at most pharmacies. Simply spray the formula directly onto the target and leave it to soak in. You should use a facemask to ensure you don’t breathe in any harmful bacteria. Although hydrogen oxide is effective at removing mould, once present, it is very difficult to stop it returning. Don’t like the idea of using harsh chemicals? Luckily, there is a better way! Want to rid your shower of mould with little effort? Diamond Fusion® NZ makes cleaning your shower glass a breeze! Protect your shower glass with Diamond Fusion’s nanotechnology and reduce your cleaning times by up to 90%! Book a Diamond Fusion® technician here or call 0800 66 72 78 today! Unsightly 'hard water" stains are the result of excess minerals in the water that accumulate over time. Try as you might, they just don't seem to disappear. This homemade solution, like the methods before, requires a thorough application. Spray vinegar on the glass shower door and leave it for a few minutes. Next, you will have to make a paste using equal amounts of baking soda and salt. Use a damp non-scratch cloth or sponge to wipe the solution over the door and scrub until the stains are removed. Unfortunately, this method isn't going to stop mineral stains from returning. For that, you are going to need the patented and award-winning Diamond Fusion® formula! Scouring the internet for the best way to clean shower glass? There are many DIY methods out there that claim to offer a miracle solution. If, like millions of others around the world, you are tired of conjuring up homemade potions and handling harsh chemicals, only for soap scum and water stains to resurface in a few weeks, you'll be relieved to know that there is a better way to keep your shower glass clean and streak-free! Diamond Fusion® is the world's number 1 glass cleaning product and its globally-patented, environmentally friendly formula can save you up to 90% on your cleaning times! The award-winning Diamond Fusion® solution can be found all around the world from America to Europe and Australasia to Africa. Discover why millions of people around the world choose Diamond Fusion® by calling 0800 66 72 78 or book a Diamond Fusion® technician today!